According to the U.S. Commerce Department, close to one million homes and apartments are constructed each year in America. While each of these houses is different, each is built in a similar way. Every home includes several main components which are built according to standard regulations. These include the foundation, walls, roofing and insulation, as well as electrical wiring and water plumbing. Before construction of a house can begin, its foundation must be placed. The foundation of most homes is made from either blocks of cement or poured concrete. In homes with basements, this concrete foundation also serves as the basement walls. The large portion of flat concrete that serves as the base of construction is called the "slab." Once poured, this slab is made waterproof using a special sealant. The concrete slab foundation is usually embedded with metal rods, called "anchors." These anchors are used to connect the foundation to the rest of the construction, and keep the entire house stable. A solid foundation ensures that the house does not shift, even during environmental changes such as heavy rains and cold temperatures. The walls of a house give it its structure and distribute the weight of the entire construction onto the foundation. 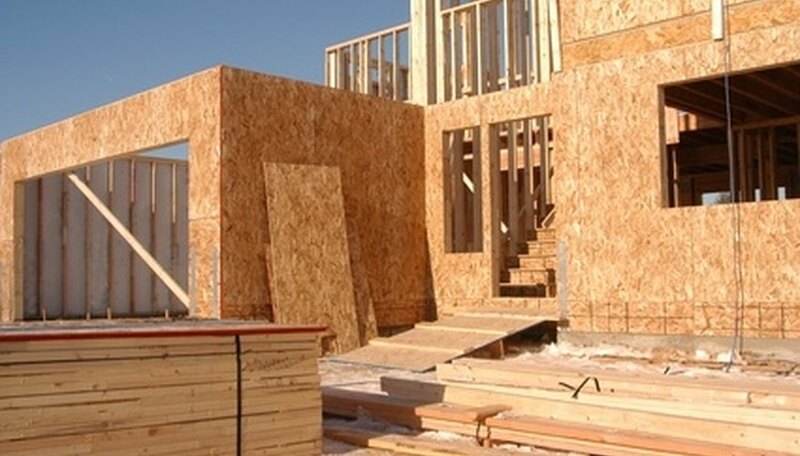 Construction of the walls begins with a process called "framing." Here, the outlines of the exterior walls are built from strong wooden planks and anchored to the foundation. Once the basic framing is complete, sheets of wood paneling are attached to the exterior of the house. This encloses the living space. At this stage, the construction begins to resemble an actual house. Siding is commonly added to the exterior. This siding can be made of plastic, wood or brick, and protects the wood structure of the home from the elements. The roof of a house is created in a similar way as the walls, using sheets of wood placed over the framing. For roofing, however, extra protection is needed to protect the house from rain, wind and snow. This protection most commonly comes in the form of shingles. Shingles are made from a combination of fiberglass and asphalt, making them water-resistant and fire-retardant. When shingles are placed on the roof, they are overlapped to create a continuous pattern. This way, water is unable to enter the home from the roof. Insulation is placed on the walls of a house to help keep the interior temperature constant. This allows the house to stay warm in the winter and cool in the summer. The most common type of insulation comes as a roll of fiberglass material. This insulation covers the entire inside surface of the house and is used to fill openings in the framing. Once the walls have been covered in insulation, a new layer of protection is added. This layer is called "drywall" or "sheetrock." Once in place, the new layer holds insulation in place. This layer of painted drywall is what is commonly seen as the interior walls inside of a house. After the insulation and drywall have been placed, several finishing touches are installed. One of the most important of these is the plumbing. Plumbing includes the pipes, connections and drains necessary to bring water to every sink and bathroom in the house. Finishing the electrical wiring is one of the last stages of home construction. This wiring distributes electrical power from an outside transformer to every room and outlet in the home. While most wiring is placed before insulation is installed, it must be properly connected before it becomes operational. Switches, dimmers and sockets in each room must also be installed and linked to the household wiring. Once these finishing touches are complete, the newly constructed home is ready for inspection and occupancy.